Spring is coming, which means a lot of walking outside. I like to listen to music or podcasts when I am walking. The problem I have is my ears get sweaty and when they do I have trouble keeping most earphones in. I could wear over the ear headphones, but then I can’t hear what is happening around me and since I have to walk on the side of the road that could be dangerous. When I try to wear most ear buds they are constantly falling out as I am walking. Which means I am continually trying to stick them back in or they end up dangling down in front of me and I can’t hear the music. Either way it is very frustrating. I wanted to try to find a solution for this problem before the spring weather comes into full swing and I think I have. Yurbuds slogan is “Developed by Athletes for Athlete” and according to the box they are guaranteed to never fall out. They come in a small box and inside the box are the headphones , a small carrying case and a card with instruction on them. The earphones are kidney-shaped and fit snugly inside the ear and then “lock in”. The hardest part is getting them in right, which is key to them not falling out. Once they are in they stay in. I wore them walking on the first warm day of spring and although I was sweating they didn’t fall out. The true test though will come in the summer when it is humid and its 80 degrees, while I am walking. My other complaint is the fact that the cords do get tangled up if you just throw them in your pocket. The earphone are made of a soft silicon and they feel very comfortable in my ear. The audio sounds fine. I was listening to a workout music playlist from Songza and the bass beat was good, not great but good. The upper and middle tones sound fine. If you keep the volume down to a reasonable level you can hear what is going on around you, which I appreciate. 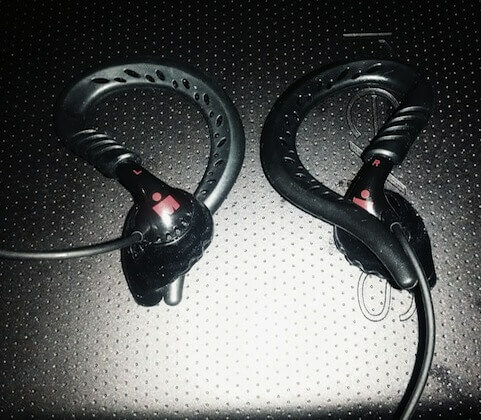 Overall I am happy at this point that I purchased Yurbuds Ironman Series.